On the 8th May 2015, one of the Duke of Wellington’s paintings in Apsley House know as The Titian’s Mistress, was being restored. Having come into his collection in 1813, experts believed the painting was a copy produced by later followers after Titian’s death in 1576. However, after years of dirt, grime and overpainting was removed by a local art conservator, the Roman letters spelling out TITIANUS were revealed, meaning that this painting was in fact a genuine Titian painting and not a copy as originally thought. This painting, amongst others, came to London as part of a collection the Duke of Wellington had acquired after a victory in Spain during the Napoleonic wars. In this collection there were 3 Titian style paintings, amongst many other paintings by other artists. These 3 paintings were believed to be copies by later followers of Titian. However, over the years, they have all turned out to be Titian paintings and not copies. Conservation on the Young Woman Holding Rose Garlands and on the painting of Danaë a couple of years ago, confirmed these were also either painted by Titian or painted under his very close supervision in his studio. All three paintings are due to be displayed along with their X-rays that helped to confirm the attributions. The X-ray of The Titan’s Mistress even revealed a completely different half-finished painting underneath it. 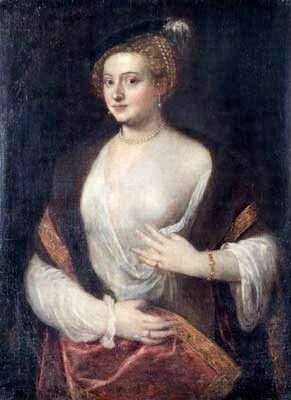 Years of overpainting had hidden this historic painting’s true identity, but after some careful conservation and restoration, English Heritage has another genuine Titian to add to their collection.